All NEW furniture package has arrived and is awaiting your arrival! Recliner chair in the living room, swivel bar stools at the eating granite eating bar. Great new thick pillow top mattress for your comfort, fully protected with zippered bed bug protected cover. New comfy lanai furniture to relax and enjoy the spectacular view, no plastic hard chairs! Portable Air Conditioning Unit for your comfort in the bedroom at night during the summer months. Completely remodeled 1 bedroom/1 bath within a stone's throw to the Pacific Ocean! When you enter the unit you will be taken back by the breath-taking unobstructed view of the Pacific Ocean. Open the patio door and immediately feel the ocean breeze from the trade winds and smell the fresh salt-water air! The next morning you will awaken to the warm glow of sunrise. You can sit on the lanai with your first cup of coffee and enjoy the boat traffic from the river right next to the building. You are also located right on the walking/bike path called Ke Ala Hele Makalae ('the path that goes by the coast') that will eventually go from Nawiliwili to Anahola. During season you will see whales breaching from your lanai. You now know what paradise feels like. 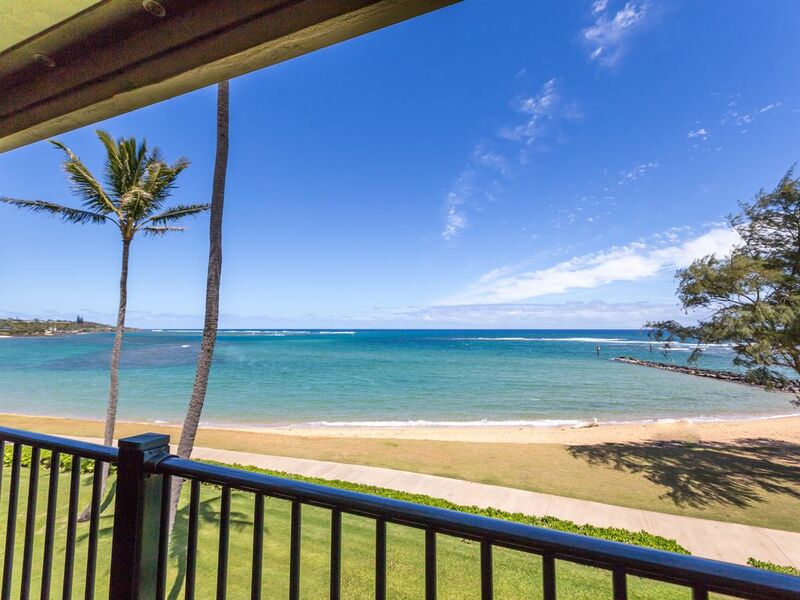 You will find your condo A306 on the top floor in the Beautiful Pono Kai Resort with 12 acres of meticulously manicured grounds in addition to koi ponds and amenities listed below. It is in the historic town of Kapaa, centrally located on the East Side of Kauai, it is convenient to all of the Garden Isle attractions, only 15 minutes from Lihue Airport and walking distance from many restaurants, grocery, and fun shops and stores. The condo is on the 3rd floor, within steps of the elevator. Being on the top floor, it’s private, there is no over-head noise ... just the sound of the gentle sound of the ocean surf. FREE Wi-Fi interenet service is provided. It features a washer/dryer in the unit, which is an unusual feature on-site. Freshly remodeled with all new, kitchen cabinets, stone counter-tops, kitchen dishes/ pots & pans/utensils/ linens and more, you will not need to worry about running out and buying that essential item to cook with. You will rest at ease with a hotel bed concept where all linens are laundered between guests! Enjoy your first pot of complimentary coffee, and if you plan on cooking spices are available. Many more amenities you will not find in other condos! The resort itself provides free parking and the parking for the 'A' building is right out front. For your convenience the front desk is open 24 hrs and there is an activities desk in the lobby so you can arrange your island adventures. I’m a flight attendant with 30 years travel experience. I know the special things that make a stay away from home comfortable and will provide you with a clean environment for you to relax and enjoy this beautiful island of which I am a resident. I am sure that your stay will be memorable, and will provide you with my cell phone number if you have any questions or concerns. This a very centrally located resort, you will arrive at your sightseeing destination within 45 minutes of car travel, excluding Waimea canyon and the west side which takes about 1 hour 15 mins. Pono Kai is a well maintained and respected resort condo complex with years of operating experience. It is located right in the heart of charming Kapaa town, with restaurants and shopping within one block. I live here year round and I also live in Kapaa. Kapaa is a real local town with very friendly residents and with more of a laid back feeling than other areas of the Island. Washer & Dryer in Unit! Newly Remodeled with Upgraded Kitchen & Bath, All New Kitchen Supplies: Dishes, Utensils, Pots & Pans, Glassware Ect., New Bath & Bed Linens, Hair Dryer & Toiletries, Guaranteed Cleanliness, Lighted Tennis Courts, Putting Green and Koi Ponds Onsite, Bike & Walking Path in Front of Building, Close Convenient Parking, Local Fishing Charters on River Next to Building, Close to Elevator, Sightseeing Reservations on Site and This is the Closet Building to the Ocean at Pono Kai. The condo ground were super clean and lots to do, staff very helpful! We really enjoyed our stay our condo had everything you need and very comfy.will be back again. Glad to hear that you had a wonderful stay! Great location with a wonderful view. Well equipped with everything we needed. Highly recommend! Very beautiful ocean view to wake up to every morning. Kitchen is fully equipped, and everything is very clean. WiFi doesnt seem to work in the bedrooms though so you only have it in the living room. Otherwise it was a pleasant stay. I am so glad you enjoyed your stay. Thank you for commenting on the Wi-Fi in the bedroom...no one has let me know since it was changed over by the resort more than 9 months ago. Glad to report to you , there is now a Wi-Fi booster in the bedroom and it works perfectly! Excellent location - close to airport, and an easy drive to the north-eastern part of the island. Condo itself is very comfortable, had all the amenities, very clean, kitchen had everything we needed to cook breakfast/brunch, and the balcony is just amazing to sit down and relax after a tiring day exploring the island. The owner is a very nice person - very helpful in accommodating check-in/check-out requests. Overall, highly recommended. Great time !! Great unit !! This condo was perfect in every way. Awesome view, lacking nothing with great attention to the comfort of the occupants. Heart of old Kapaa town is within walking distance to shops, restaurants, farmer's market on Wednesday, art walks, craft fairs and local festivals monthly. 4 large grocery stores are within 1 mile of the area.